"I understand the gift of second chances," Fellows told District Judge James Manley before the sentence was pronounced. "I am truly sorry for what I did." Manley said he would have liked to have set a net jail sentence for Fellows that was 30 days, but because it was the man's first offense and there was no prior criminal history, he would accept the plea bargain as presented, with the addition of community service requirements. 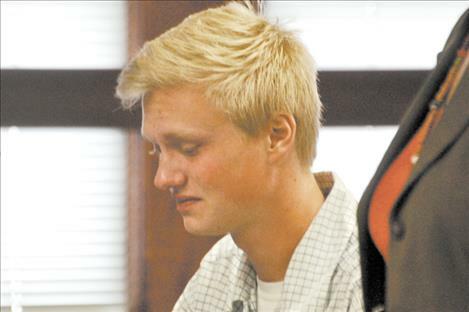 Manley said the incident seemed to be an "aberrational event" not characteristic of Fellows' character, and noted that if Fellows breaks any conditions of his sentencing agreement then the teen will face up to 20 years in Montana State Prison. "All we could think of is that it was unbelievable that no one was killed," Mausshardt said of the truck and bus's crushed metal. Mausshardt said he didn't want Fellows to go to jail for years, but that he would like to see the teen write letters of apology to those on the bus and the other bus that Fellows almost hit. He also suggested community service be imposed, and for Fellows to have to serve 30 days in the county jail. "He used a lethal weapon on 10 innocent kids and a bus driver," Mausshardt said. "It's not that different to me if he had gone into Cherry Valley school and pointed a gun at them, but not used it." Parent Francine Pierre also said she didn't want Fellows to be behind bars for years, but that she wanted Fellows to understand the gravity of his actions. "I don't know what you were thinking," Pierre said. "I'm angry. I want you to be in jail, but not for years. I want you to get something out of it ... You could have killed my kids. You could have killed yourself. I don't want you to walk out of here and think you got a slap on the wrist." Manley wanted to attach some sort of requirement for restitution during the sentencing, but a concrete number is required for that to happen and Fellows's insurance company expects it will take a year before that estimate is available. Fellow’s attorney said his coverage should cover up to $360,000 of the cost of replacing the school bus. The bus was totaled and the district had to rent a bus for the remainder of the school year.